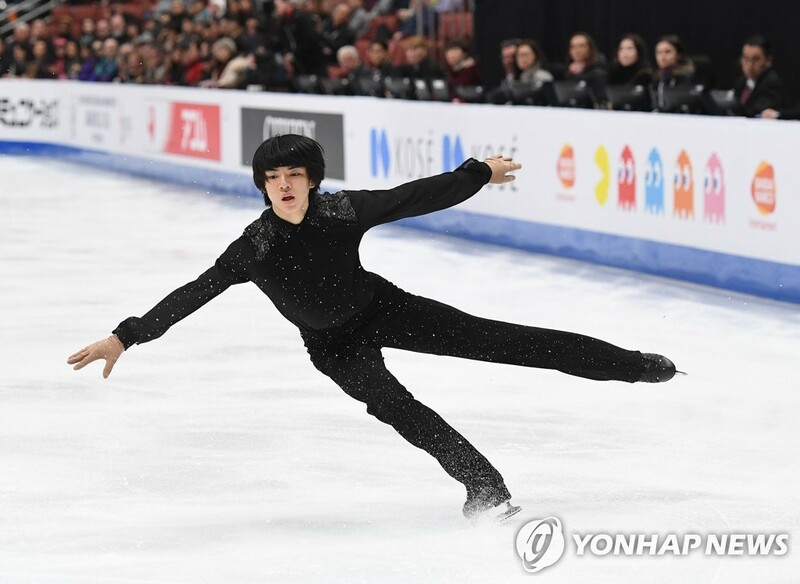 SEOUL, Feb. 10 (Yonhap) -- With the podium in sight, South Korean figure skater Cha Jun-hwan faltered in the free skate to finish sixth overall at the Four Continents Figure Skating Championships in California. The 17-year-old scored 255.83 points overall at Honda Center in Anaheim on Saturday (local time), unable to add another prize to his collection of medals. Cha was trying to become the first South Korean man to win a medal at the Four Continents, an International Skating Union (ISU) event open to skaters from Asia, Oceania, Africa and the Americas. Cha earned 158.50 points in the free skate, only the eighth-best score in the field and nearly 16 points off his career high. He was in second place after Thursday's short program with a personal-best score of 97.33 points, 2.85 points behind the leader, Vincent Zhou of the United States. Kim Yu-na, the 2009 champion in the ladies' singles, remains the only South Korean medalist at this annual event. Shoma Uno of Japan won the Four Continents title with 289.12 points. He was in fourth in the short program with 91.76 points but topped everyone with 197.36 points in the free skate to climb to first place overall. Jin Boyang of China finished second overall with 273.51 points, followed by Zhou with 272.22. Cha had a wobbly landing on his opening jump, a quadruple toe loop. He bounced back with a clean quadruple salchow and then a triple lutz-triple loop combination. But he was shaky with his fourth jump element, a triple axel-double toe loop combination, and cost himself more points with his final triple-single-triple jump combination. Cha was still the best South Korean in the men's singles. Lee June-hyoung and Lee Si-hyeong finished 14th and 15th with 188.10 and 183.98 points, respectively. So far in the ongoing 2018-2019 season, Cha has won two ISU Grand Prix bronze medals and then picked up another bronze at the ISU Grand Prix Final. No other South Korean male skater had reached the podium at the Grand Prix Final. Earlier in the fall, Cha won two silver medals at lower-tier ISU Challenger Series events. Cha will now try to regroup for the ISU World Figure Skating Championships in Saitama, Japan, beginning on March 18.